To add more sorting options, use Sort Visible Links scipt (you should have Greasemonkey Firefox addon to get it work). Official Delicious toolbar for FireFox is another way to sort your tags and Bookmarks. With it you can sort your saved URLs by site, by date, by popularity (most visited), by last visited and alphabathically. 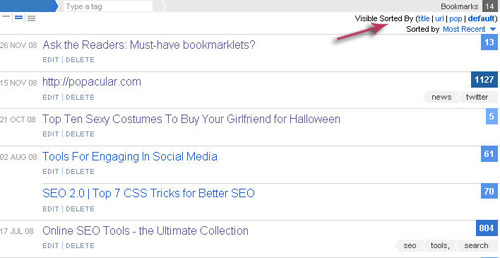 Useful tip: check out this site that sorts all Delicious bookmarks by global popularity. I really appreciate this article you have shared with us, aside from the brilliant info you have given it lets us know the good benefits in choosing the best bookmarking site.